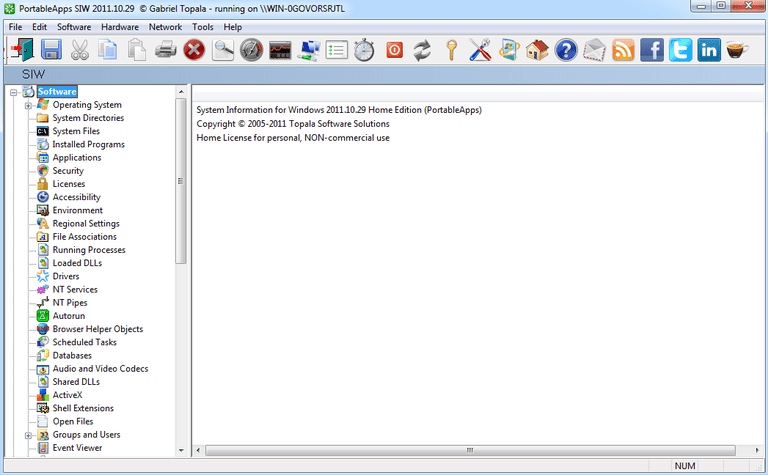 System Information for Windows (SIW) is just that: a system information tool for Windows. It's completely portable and provides an aggregated list of software, hardware, and network information that's well-organized and easy to read. This review is of SIW version 2011.10.29. It doesn't appear like this free version of SIW is still being developed, but if so, and there's a newer version I need to review but missed, please let me know. There are three basic sections in SIW where all the information is gathered: Software, Hardware, and Network. Inside these categories are a combined total of 50+ sub-categories with a wealth of information in each. SIW can be used in Windows 7, Windows Vista, Windows XP, and Windows 2000. See the What SIW Identifies section at the bottom of this review for all the details on the hardware and operating system information you can expect to learn about your computer using SIW. There are many things to like about SIW, but there are also a few pitfalls. SIW is definitely the program I'd recommend if you're looking for detailed hardware and software information but you don't want to feel overwhelmed and confused with the data, something similar system information utilities can sometimes do. I really like that everything is organized and categorized so well. It's not a problem at all to sift through the side panel to find the exact component you need information for. Clicking on a section can sometimes take a little while before the information is shown, but it's really not that big of an issue when you see just how detailed SIW can get. Though this program is filled to the brim with valuable data, it doesn't let you export any of it to a file for later use, which is really unfortunate. The only thing you can export is a brief summary of a few things that you can actually find without even using SIW, like basic memory and storage information. It's also too bad that Windows 8 users can't use SIW. If you're running Windows 8, I recommend using Speccy or PC Wizard. Overall, I think SIW is ideal for both a brief or a detailed look at your computer, as well as for both novice and advanced users.